Our Marine EFI (MEFI) Scan & TuneTM system allows you to download the internal MEFI programming to your PC or laptop with our MEFIburnTM program, change the operating parameters of the controller, and then reprogram the controller with your modifications. It also allows you to view all of your sensor systems in real time and log the data for later viewing, in addition to seeing which malfunction trouble codes, MALF's, have been set. Some competing systems will only allow you to monitor the performance of your boat or off-road vehicle's engine controller and reset engine trouble codes. Other costly packages force you to use an inconvenient hardware dongle or key, and only work with a few versions of the MEFI ECM series. Those days are over! 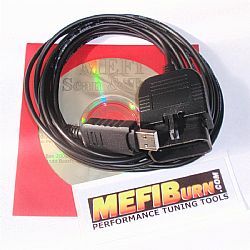 A CD-ROM containing all the software you need to do both monitoring and tuning of your controller. A Step-By-Step set of instructions that will show you how to get up and running quickly. 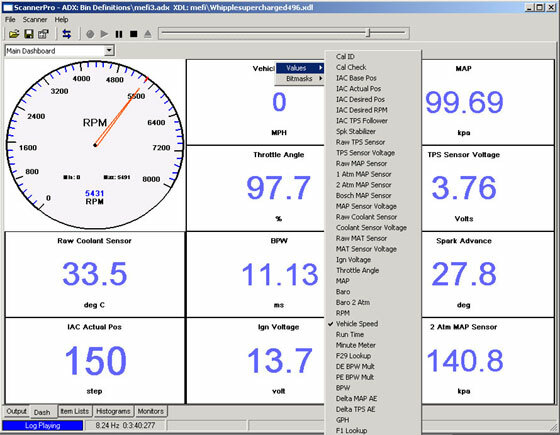 Scanner Pro is used for doing engine monitoring, data logging, and malfunction trouble code reading. We have developed MEFI 1, MEFI 2, MEFI 3, and MEFI 4 definition files that allow you to take full advantage of the features that Scanner Pro has to offer. Our custom-designed interface cable allows you to do real-time monitoring and data logging of the MEFI engine controller. A critical step in the tuning process is the ability to upload and download programs between your MEFI controller and your PC or laptop. We have developed custom software, the MEFIburnTM program, specifically designed for MEFI controllers to do that data transfer. 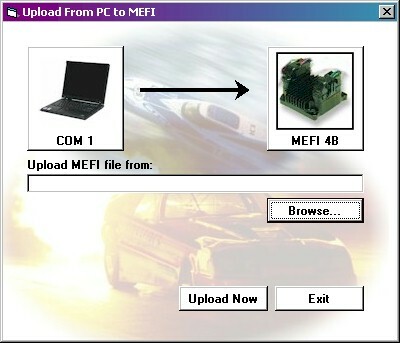 This MEFIburnTM software can do both the download and critical upload (programming) functions. It works with the common automotive .bin file format, the Motorola S-record .ptp file format, as well as the Ingenius Pro .cal, .asm, and .umi file formats. The MEFIburnTM program has the capability to convert files between all 5 formats, so regardless of the calibration or tuning file type you have, you can use it. Click for MEFIburnTM screenshots and detailed program info. TunerPro is a free, donate-if-you-like-it tuning platform aimed at making tuning easier and cheaper. 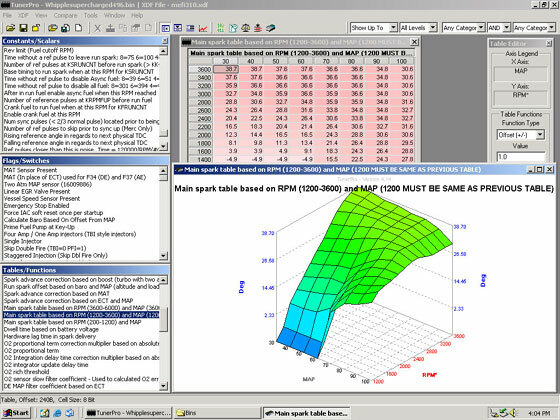 TunerPro started life as GMECM Edit, and debuted in early March of 2003. TunerPro has since grown into a very robust tuning tool. Click for TunerPro screenshots and detailed program info. Click for ScannerPro screenshots and detailed program info. We have the capability to reprogram the calibration and tune of your Ram Jet 350 or Ram Jet 502 MEFI ECM. We do this Ramjet tuning on a mail in basis, and charge $200 for basic tuning. Don't suffer with a poor running Ramjet any longer! We can custom tune your MEFI controller, program your ecm remotely, anywhere in the world, and do MEFI Calibration Translation. See our custom and remote tuning page. General Motors in Kokomo Indiana, formerly Delphi Delco Electronics, manufacturers the finest engine controllers in the world, and their development, testing, and manufacturing capabilities are unrivaled. The MEFI line of controllers has evolved over the years and always has been on the cutting edge of engine control technology. The MEFI has been deployed in myriad applications from marine to industrial to racing to crate engine packages. 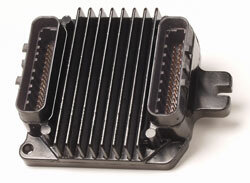 This controller has enormous flexibility and the number of internal engine control parameters is staggering. To date, this marine ECM controller has faced challenges for custom deployments and modification because of the lack of a competitively priced and widely deployable software and hardware solution. Now, the only question is if you want the Standard or Professional version of the MEFIburnTM package.